WEST LAFAYETTE, Ind. – A Purdue University-affiliated startup is developing instruments to precisely measure pressure, temperature and other analytics inside the harsh environments of rocket engines and gas turbines. 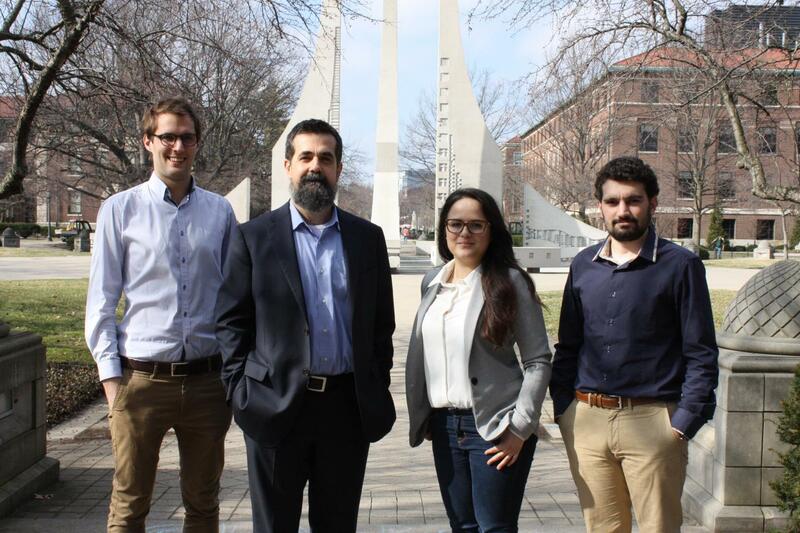 Petal Solutions LLC was founded by Guillermo Paniagua, a professor of mechanical engineering, and Valeria Andreoli, David Cuadrado and James Braun, doctoral research assistants. Paniagua said the group's expertise in computational fluid dynamics has allowed the researchers to push the boundaries in cooling and design probe technologies. "It is fantastic to be able to take our hard work from the classroom and lab developments, to create instruments that will help society," said Paniagua, president of Petal Solutions. The researchers decided to design their own instrumentsto mount in engines to track engine performance because they couldn't find anything adequate on the market. "Conventional instruments all had various limitations," said Andreoli, who is pursuing a Ph.D. focused on engine transient analysis. "They are limited in terms of maximum temperatures they can withstand. They are limited in terms of how fast they can react. Things happen inside an engine extremely fast. If you want to understand how the engine is performing, you need a measurement device that can capture all the data." The researchers were confident they could build more precise instruments that could withstand higher temperatures while providing a high sampling rate with high accuracy, particularly downstream of the combustion chamber. "We saw that we could design instruments that would provide us the data we needed," said Cuadrado, who is pursuing a doctorate focused on development of inverse methods for heat transfer. The researchers say they will be able to tailor products to create sensing devices and in-house software packages customers need. Small changes in engine performance can add up to big savings, the researchers say. In the aerospace industry alone, a 0.5 percent improvement in engine efficiency would lead to $2 billion a year in fuel savings. So, putting a small, unobtrusive device in jet engines could provide valuable feedback. The researchers, based in Purdue's Zucrow Labs, the largest academic propulsion lab in the world, have designed a device 4 millimeters in diameter that can mount inside engines and track parameters, such as pressure and flow direction in high temperature environments with high accuracy. They already have shown through simulations that their device works. They are working on a prototype that can withstand temperatures up to 1,300 degrees Fahrenheit. By next year they plan to have a prototype that can withstand temperatures up to 3,000 degrees. Their plans call for Petal Solutions to provide client-specific software to process sensor output, and certificates attesting to the calibration of the device. A hurdle for the researchers will be trying to enter a large market with a lot of big players. "The challenge is to get the chance to prove our concept," Andreoli said. The researchers plan for now to remain independent and fund their company through research grants and awards. Petal Solutions was selected in December to receive a $20,000 Black Award from the Elevate Purdue Foundry Fund. That makes the company eligible to compete for the second-tier Gold Award. The company also recently received $5,000 from the Burton D. Morgan Business Model Competition. Petal Solutions is targeting the jet instrument market first, specifically research and development and plans. The researchers have obtained a provisional patent for a measurement system with the help of the Purdue Office of Technology Commercialization. They plan to develop specialized measurement techniques for clients. The researchers say they learned through customer discovery research that different segments of the engine industry have different demands. Rocket makers have placed a priority on being able to withstand high temperatures while the gas turbine industry places a priority on precision and robustness. "Our focus has been to identify and meet these needs," said Braun, who is completing a Ph.D. focused on novel high-speed propulsion concepts. The researchers say they were worried at first their innovation might be too technical but learned about creating a business through the Purdue Foundry, an entrepreneurship and commercialization accelerator in Discovery Park's Burton D. Morgan Center for Entrepreneurship. "That's where we developed our go-to-market strategy," Cuadrado said. "We made a business plan to have a more clear vision of the company."